A list of world record scores in the main gaming series of the Touhou Project, up to date as of 2018-07-24. Touhou has a large and active scorerunning community, especially in Japan and Korea, where scoring competitions known as 定期大会 (Japanese: teiki taikai, lit. "periodic tournament") are held every two weeks. The records on this page are taken and combined from scoreboards and replay archives, including Royalflare (formerly known as Touhou-Storm), Maidens of the Kaleidoscope, and various players' personal pages. Troubleshooting tip: if a replay isn't downloading correctly from its page, either right-click it and choose "Save As…", or let it load a page full of gibberish and save it as a .rpy file using "File" menu. If the replay has a file extension ..._rar.jpg, please rename to .rar and unpack. A replay upload guideline is available here for your convenience. WARNING: The replays on the High Scores page are here for reference and should not be reuploaded to RoyalFlare. Please be reminded that Touhou Wiki does not condone resubmission of past high scorers' replays to RoyalFlare. 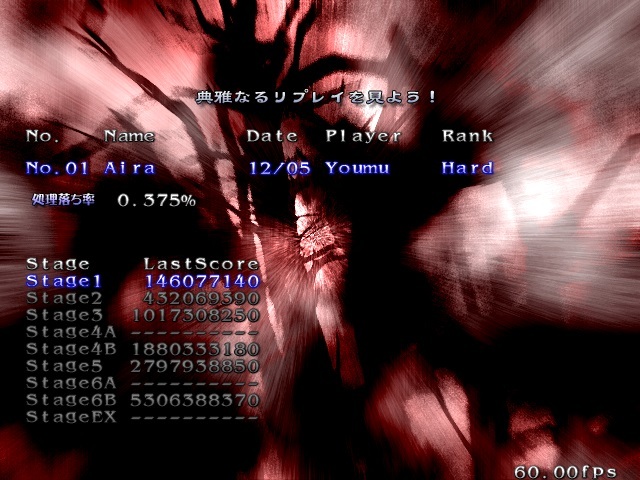 The single highest recorded score in each Touhou game, without regard to character selection or difficulty level. This table will not be sorted according to the replay date. Instead, it will be sorted by the wiki's update date. Scores with a ◇ mark are the difficulty records for certain game, while scores with a ☆ mark are the world records of certain game. Click the game name to expand the table. ↑ Note that this is the highest score that has a known date and a replay - his actual personal best is higher. This page was last edited on 24 July 2018, at 20:04.